West Lafayette, IN – Hunger Hike 2015 supports the fight against hunger locally through LUM, regionally through Food Finders, and globally through the Haiti Ministry at St. Thomas Aquinas. On Monday, August 24th, the pastor of the parish in Baudin, Haiti is making a rare visit to the Lafayette area and will be meeting with the Hunger Hike team to update us on their current situation and issues as well as the impact Hunger Hike has on the people of Haiti. Father Charles, the pastor at St. Francis Xavier Church in the Diocese of Jacmel, Haiti, will be available for question/answer and individual interviews. Fr. 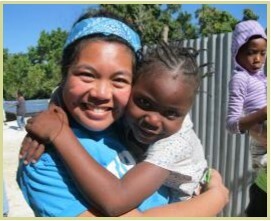 Charles will be joined by the St. Tom’s Haiti Committee members who will share their plans for upcoming visits to Haiti. Representatives from the three sponsoring organizations (Lafayette Urban Ministry, Food Finders Food Bank, Inc. & St. Thomas Aquinas Center) will also be in attendance. traditional 3K Walk on Sunday as well as a 5K run on Saturday. This year Hunger Hike is Saturday, September 19 & Sunday, September 20, 2015. All Hunger Hike proceeds directly support the Lafayette Urban Ministry food assistance programs including the St. John’s/LUM Food Pantry, Food Finders Food Bank Inc., and St. Thomas Aquinas’ Haitian Ministry including the Haiti Water Purification Project. More Information: 10 Facts about Hunger in Haiti.